Regular readers of this blog know that a few weeks ago one of my writer friend's made the outlandish suggestion that eighteenth century France was simply not a romantic era. After she made that statement, I heard a metallic clank. I think it was the sound of the gauntlet landing on the ground. After I recovered from the initial shock of having heard such a statement, I retrieved the gauntlet. Since then, I have endeavored to prove to her (and you, my gentle readers) that the era of powdered wigs, fan languages, early morning duels, masquerade balls, witty salonières, and daring escapes from the guillotine, was indeed a romantic time. I have shared with you details about the life of the dashing and debonair Chevalier de Saint-George and the epic romance between Napoleon Bonaparte and his beloved Josephine. Today, I would like to tell you about two relatively unknown figures from that period in time. In the Spring of 2005, I embarked on an exciting and ambitious driving trip with my dear friend, Cindy. 12 days, 1 ridiculously small rental car, 10 cities, 4 museums, 8 château tours, 1 behind the scenes palace tour, and 32 pain au chocolat! The year before, we had travelled to England, Scotland and Wales (I shared the embarrassing details of that trip in How Not to Visit the UK) so Cindy could conduct research for her paranormal romance novels . 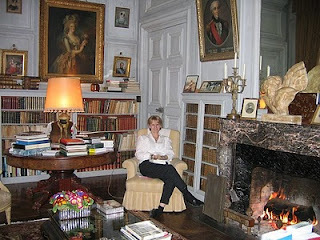 This trip was about fun, food, and finding new fascinating facts about France for my own novels. Although I had toured several chateaux during previous trips to France, I had never actually spent the night in such a grand, historic building. We planned on staying two nights in two different chateaux. It was with great anticipation that I turned our Mr. Bean Mobile onto the road that would take us to the first chateau, situated on the river Loire in the heart of the Loire Valley. It was with great disappointment that we eventually found ourselves in a dreary room outfitted with copious cobwebs and crusty bathroom towels. The building wasn't without charm. The 18th century painted ceiling in the dining room was truly spectacular. Despite the numerous family portraits and photographs that were on display throughout the home, it still felt impersonal and devoid of the spectral vibrations that many old buildings emit. The owner spent his time in a tiny office room adjusting the rabbit ears on an old television set instead of regaling us with the history of his grand abode. Regretfully, the first chateau had been little more than a pricey pit-stop. The second chateau was in the verdant countryside of Normandy, just a few miles from Mont Saint Michel. I felt the spectral vibrations as soon as we turned down the long, tree-lined drive and again when I gazed upon the impressive chateau with the steeply-sloped mansard roof, curved pediment, and tall windows. The neatly clipped lawn, white painted footbridge spanning the pond, and the charming outbuildings stirred my writer's imagination, but it was what I discovered inside Château de Boucéel that made a lasting impression on my romantic soul. We had barely stepped onto the gravel drive when the front door opened and a tall, nattily dressed man with aquiline features rushed out to help us with our bags. 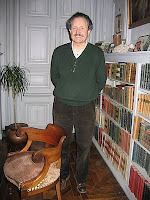 He identified himself as the Comte de Roquefeuil and welcomed us to his home. He ushered us inside the chateau and then took us on a tour of his home, proudly pointing out special antique pieces (including a framed letter from the family of Marie Antoinette and a Louis XV homme debout). Then he showed us to our rooms. I was staying in the Marquise's Bedroom. I am not sure what impressed me more: that my bedroom had original Louis XVI panelling or that I had spoken to a living, breath French aristocrat! I realize this has been a rather long digression, but please bear with me as I am now getting to the gist of this piece. After unpacking, we joined the Comte in the front salon for refreshments and a thorough history of the chateau. Beside a roaring fire, with the scent of old books filling the air, I listened to the story of the Marquis and Marquise de Montecot. Most eighteenth century unions were formed for economic rather than emotional reasons. Once the fortunes had been combined and the requisite heir had been produced, it was quite common for the husband (and many times the wife) to take a lover. The Marquis and Marquise de Montecot were highly unusual in that they loved each other. While many of his fellow aristocrats were hiding coins and jewels in the false bottoms of their traveling trunks and slipping out of France to avoid a close shave with the National Razor (contemporary slang for guillotine), the Marquis de Montecot was building a secret room above his wife's boudoir so that he might remain close to things he held most dear: his wife and chateau. While his wife began spreading the rumor that he had abandoned her by joining the scores of other emigres living comfortably across the Channel, the Marquis actually hid in the secret room (which the Comte refused to let me see, despite my many hints). At night, he would leave his hiding place and enter his wife's room through a concealed door located beside her bed. 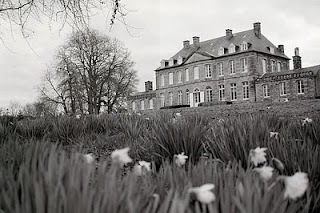 The Marquise filed for divorce on the grounds of her husband's "abandonment" and was able to save the chateau from being confiscated by the Republican Government (as was the practice). After the Revolution, the Marquis came out of hiding. The pair remained married until the Marquise died. Some might read the words "French Revolution" and think only of angry mobs carrying severed heads on pikes, ransacked buildings, blood washed streets. I think differently. I hear the words "French Revolution" and I think of noble aristocrats standing tall in the shadow of the guillotine, resolute in their beliefs, determined to face death with honor. I think of the defiant peasants of the Vendée who risked life and limb to restore an order that respected their religious beliefs. I think of a man reduced to hiding in the attic of his grand home just so he can be near his beloved wife. I believe that from tumultuous times come epic romances. Leah Marie Brown in the library at Chateau Bouceel. Over her shoulder, to the right, is a portrait of the Marquis. If that is not romantic, then I don't know what is...What a great love story. I am also putting the Chateau de Bouceel high on my list of places to stay! Look at my Pal all perched on that fine bedding! MAN, what great times we've shared--and many more to come! That place was AMAZING, Leah!! How much more romantic CAN YOU GET THAN THAT?? I echo your words, Stephanie! Where Leah sees the romance in the secret passageway, I was SCARED. I just knew some ole creepy somethin-somethin was going to pop out at us in the middle of the night. Lol! Loved that trip, my friend, and all the fabulous places we explored. Looking forward to more with you!!! :) XOXOX! Thanks Cindy! I loved that trip, too, my pal. What fun we had dueling with stale bread in a field in front of a chateau and singing along with Sir Mix A Lot while driving that ridiculous Mr. Bean Mobile. Update: The Comte was kind enough to read my blog and send me a lovely email praising my review of his home. Nice! Truly amazing! So were some of the same furnishings (of 18th century) still there? And is that a portrait of Marie Antoinette? Only in Europe can you experience history such as this!